Rockstar Energy Suzuki Factory Racing’s Clement Desalle mastered the many ripples and ruts of a demanding Talkessel circuit in Teutschenthal, close to the city of Halle in Germany to bring the potent RM-Z450 its fourth overall win of the season. Talkessel was the scene of round 11 of 17 in MXGP and the second FIM GP in the space of a week. Some 31,000 fans rolled into the sunken venue under bright skies and a stiff breeze to see Desalle and team-mate Kevin Strijbos do battle once more and fulfil the role of protagonists in the premier category of this gripping, brutal and entertaining sport. Teutschenthal assumed its standard position as the home for the German Grand Prix after undergoing some big and important renovations and modifications for the 67th Motocross of Nations last September. The shortened and dark soil surface constituted the usual small climbs and drops and many off-cambered turns. It was a stage that Strijbos owned completely on Saturday when he raced to his third pole position of the season. It was ‘2013 ‘Nations winner Desalle who was the more effective away from the line in both 30 minute and two-lap motos on Sunday, however: Desalle was nursing a stiff left wrist after his hefty prang in Italy last week, but the side-effects were hard to notice as he closed down a five-second gap to leader Max Nagl and hassled the German all the way to the finish line; setting the fastest lap in the process. It was a close and exciting duel but Desalle could not force through to first place. In the second moto he took matters into his own hands from the third corner and once ahead did not look back. The ‘#25’ motored to his seventh race-win of the year and his sixth from the last five Grands Prix. Strijbos was not far behind. He struggled to replicate his bright getaway from Saturday and in the first moto was especially frustrated trying to overtake Valentin Teillet and eventually finished seventh. He was more concise in the second sprint as two measured overtaking moves pushed the Belgian up to second place for a Rockstar Energy Suzuki 1-2. Strijbos was fourth overall and just missed the rostrum by two points. The repercussions of proceedings in Germany are visible in the MXGP standings where Desalle has totalled 452 points so far; only 25 behind Cairoli. Strijbos, meanwhile, continues to consolidate a comfortable position in fourth place, some 108 points in front of Shaun Simpson in fifth. Grands Prix in Sweden and Finland represent rounds 12 and 13 of the championship and will take place across the first two weekends of July. 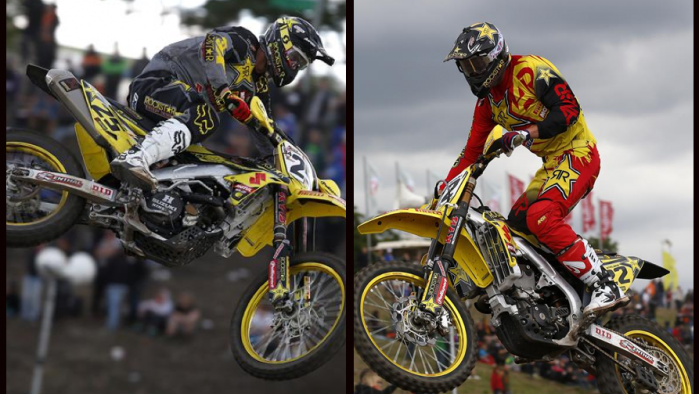 After intense competition in Italy and Germany, Rockstar Energy Suzuki WMXGP can taste some respite and prepare for the three fixtures in July that will carry the 2014 campaign onto the home straight.